BASRA, Iraq (AP) — Iraq's embattled prime minister Haider al-Abadi visited the southern city of Basra, on Monday, where 15 people were killed in weeklong protests over poor public services and soaring unemployment. BASRA, Iraq (AP) — Angry protesters stormed the Iranian consulate in the southern city of Basra on Friday, setting a fire inside amid a wave of demonstrations that have turned deadly in the past few days, a security official and eyewitnesses said. BAGHDAD (AP) — Iraq's newly-elected parliament held its first session on Monday as two blocs, both claiming to hold the most seats, vied for the right to form a new government. BAGHDAD (AP) — Iraq is reducing visa charges for Iranian pilgrims who visit to mark a major religious occasion later this year. The reduction will only apply to pilgrims of the "Arbaeen," the anniversary of the passage of 40 days after the death of the deeply revered Shiite Imam Hussein, the Prophet Muhammad's grandson. News of the reduction of the visa charges, which are normally $40, was posted on the government's website Tuesday. It did not say how much the reduction will be. BAGHDAD (AP) — Iran has cancelled a visit by Iraq's prime minister after he said that while he was opposed to renewed U.S. sanctions on Tehran he had no choice but to abide by them, an Iraqi official said Sunday. BAGHDAD (AP) — Iraq's election commission says the result of its recount of ballots from May's parliamentary elections doesn't alter the overall outcome of the vote. 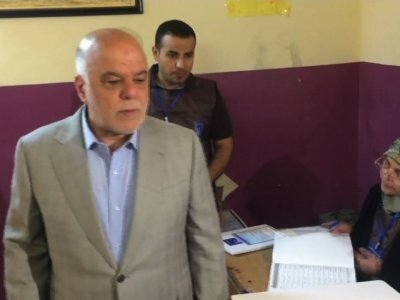 BAGHDAD (AP) — Iraq's election commission has completed its recount of ballots from May's parliamentary elections, which were marred by allegations of fraud and irregularities. The commission said Monday it didn't recount votes from eastern Baghdad because of a fire at a warehouse where ballot boxes and electronic counting equipment were stored. BAGHDAD (AP) — Iraq's prime minister on Sunday suspended the country's electricity minister over a power crisis amid mushrooming protests in the country's Shiite heartland demanding better services and jobs. Prime Minister Haider al-Abadi made the announcement on his Twitter account, saying the suspension of Qassim al-Fahdawi, the electricity minister, would last until an investigation is concluded. He did not elaborate. BAGHDAD (AP) — Iraq's prime minister on Thursday ordered an investigation into overnight explosions that tore through a mosque in Baghdad as officials raised the casualty toll to 18 dead and 38 wounded. The blasts took place in Baghdad's Sadr City when a weapons depot exploded inside a Shiite mosque, the officials said. It was not clear what triggered the explosions that destroyed or damaged 20 homes. BAGHDAD (AP) — Shiite cleric Muqtada al-Sadr, whose coalition won the largest number of seats in Iraq's parliamentary elections, has sought to reassure Iraqis about their next government, saying it will be "inclusive" and mindful of their needs. No single bloc won a majority in the May 12 vote, raising the prospect of weeks or even months of negotiations to agree on a government. Major political players began talks soon after the election's partial results were announced last week. BAGHDAD (AP) — Influential Shiite cleric Muqtada al-Sadr's political coalition has won the most seats in Iraq's national parliamentary elections, according to complete results released by Iraq's electoral commission early Saturday. BAGHDAD (AP) — The political coalition of influential Shiite cleric Muqtada al-Sadr took an early lead in Iraq's national elections in partial returns announced late Sunday by the Iraqi electoral commission. Iraq's electoral commission says influential Shiite cleric Muqtada al-Sadr's alliance is the early front-runner in national elections, with official results in from just over half of the country's provinces. The announcement Sunday night comes a day after polls closed across Iraq. The results are from 10 of the country's 19 provinces, including Baghdad and Basra. BAGHDAD (AP) — Iraqis head to the polls this weekend for the first time since the government declared victory against the Islamic State group, in national elections that could tilt the balance of power between the United States and Iran. BAGHDAD (AP) — Iraq's civil aviation authority says airports in the country's Kurdish region have been officially reopened for international flights. Abbas Omran, the authority's director, says he received a cable Wednesday night that international carriers are now allowed to take off and land at the two airports in Iraq's Kurdish region after they had been shut to such traffic some six months ago. Iraqi Prime Minister Haider al-Abadi called for the hubs to be reopened on Tuesday. BAGHDAD (AP) — Iraqi Prime Minister Haider al-Abadi has ordered an "immediate" investigation into the killing of a senior military officer by "undisciplined individuals" at a checkpoint north of Baghdad. BAGHDAD (AP) — Iraq is reopening airports in the country's Kurdish region to international flights after federal authority was restored at the hubs, according to a statement from Prime Minister Haider al-Abadi on Tuesday. The U.S. military says the fate of its ongoing presence in Iraq will be decided in "coordination with" and will depend on the "approval of" the government in Baghdad. The comments by Col. Ryan Dillon, a spokesman for the U.S.-led coalition that battled the Islamic State in Iraq, came in response to Iraqi parliament's demand Thursday that a timeline be set for the pullout of foreign troops from the country. BAGHDAD (AP) — Twin suicide bombings rocked Baghdad on Monday, killing 38 people in the deadliest attack since Iraq declared victory over the Islamic State group last month, and raising fears ahead of national elections planned for May. SYDNEY (AP) — Australia has announced an end to its airstrike operations against the Islamic State group in Iraq and Syria. The country's six Super Hornet fighter jets will soon head home in a major reduction to Australia's commitment to battling the militants in the region, three years after it began. Defense Minister Marise Payne told reporters Friday the move followed discussions with the Iraqi government, whose Prime Minister Haider al-Abadi earlier this month declared victory over the group. PARIS (AP) — Three days after declaring victory over the Islamic State group, Iraq's prime minister warns that the group's extremists might "erupt again somewhere else" without international cooperation in combatting the militants. Prime Minister Haider al-Abadi told reporters Tuesday that "we have managed to break them" in Iraq, but added that it's a worry for everyone that IS has "this unfortunate ability to recruit young people very quickly." BAGHDAD (AP) — An influential Iraqi Shiite cleric on Monday urged his fighters to hand state-issued weapons back to the government, following Iraq's declaration of victory against the Islamic State group. In a speech broadcast on Iraqi television, Muqtada al-Sadr also called on his forces to hand over some territory to other branches of Iraq's security forces, but said his men would continue to guard a holy Shiite shrine in Samarra, north of Baghdad. BAGHDAD (AP) — World leaders congratulated Iraq Sunday following the prime minister's declaration of victory over the Islamic State group. Saudi Arabia says the achievement is a big victory against terrorism in the region and the United Kingdom applauded Iraq's security forces "for their courage and sacrifice." Iraqi Prime Minister Haider al-Abadi declared victory in the more than three year fight against IS in a national address aired on Iraqi state television Saturday evening. BAGHDAD (AP) — After more than three years of combat operations, Iraq announced Saturday that the fight against the Islamic State group is over after the country's security forces drove the extremists from all of the territory they once held. Iraqi and American officials warned, however, that key challenges remain despite the military victory. BAGHDAD (AP) — Thousands of people suspected of having ties to the Islamic State group are facing widespread rights violations in Iraqi custody, Human Rights watch said Tuesday. British Prime Minister Theresa May has made a surprise visit to Iraq as part of a tour of the Mideast. Iraq's government released footage Wednesday of May arriving in Baghdad to meet with Iraqi Prime Minister Haider al-Abadi. It's May's first trip to Iraq as prime minister. BAGHDAD (AP) — Iraqi police and hospital officials say a bombing in southeast Baghdad has killed 11 people. BAGHDAD (AP) — Iraqi forces backed by the U.S.-led coalition retook on Friday the last town in the country that was held by the Islamic State group, more than three years after the militants stormed nearly a third of Iraq's territory, the Defense Ministry said. BAGHDAD (AP) — Iraq's Prime Minister says Iraqi forces are launching an operation to push Islamic State group fighters out of a patch of territory on the western edge of the country near the border with Syria. Haider al-Abadi is announcing the push during a visit to the holy city of Karbala on Saturday during the Arbaeen pilgrimage that commemorates the martyrdom of Imam Hussein, the Prophet Muhammad's grandson and a central figure in Shiite Islam. BAGHDAD (AP) — Iraq's prime minister has defended a proposal to trim the self-ruled Kurdish region's share in next year's budget from 17 percent to 12.6 percent. Haider al-Abadi told reporters Tuesday that the proposal is not "a punishment" to the Kurds in the wake of controversial independence vote held late September. That vote saw a majority support from the Kurds. Baghdad considers it unconstitutional and illegal. BAGHDAD (AP) — Iraqi Prime Minister Haider al-Abadi raised on Sunday the Iraqi flag at a border crossing with Syria days after Iraqi forces retook it from the Islamic State group, state TV announced. Al-Iraqiya TV said al-Abadi visited the newly-liberated town of Qaim and the nearby Husaybah border crossing in western Iraq. Both sit along what was once an important supply route used by IS when the group controlled large areas in Syria and Iraq. BEIRUT (AP) — With new losses, the Islamic State group has been driven from more than 96 percent of the large parts of Iraq and Syria it once held, crushing its goal of establishing a "caliphate" that challenges existing borders. The militants are left fighting for a final stretch inside Syria and desert regions along the Iraq-Syria border. Three years ago, they had defiantly erased that line, knocking down berms marking the frontier. BEIRUT (AP) — With new losses Friday, the Islamic State group has been driven from more than 96 percent of the large parts of Iraq and Syria it once held, crushing its goal of establishing a "caliphate" in the region. Syrian President Bashar Assad's military announced the capture of the eastern Syrian city of Deir el-Zour, while Iraqi Prime Minister Haider al-Abadi proclaimed victory in retaking the town of Qaim on the border, the militants' last significant urban area in Iraq. BAGHDAD (AP) — Iraq says negotiations with the Kurds over the deployment of federal forces along the borders of their autonomous region have failed. The body overseeing Iraq's security forces said Wednesday that Kurdish forces had delayed talks in an effort to strengthen their defenses, and that as a result, both sides are back to "square one." BAGHDAD (AP) — Iraq's prime minister on Monday called for calm in the self-ruled northern Kurdish region after rioting the previous night following the Kurdish regional president's decision to effectively step down. In his statement, Prime Minister Haider al-Abadi said the central government is closely monitoring what he described as "attempts to create chaos and disorder" in Irbil and Dahuk, two cities in the Kurdish region. Iraq's Prime Minister is issuing a 24-hour suspension of the movement of troops who are deployed to bring territory held by Kurdish forces back under federal control. Haider al-Abadi says in a statement Friday the order was given to "prevent clashes and bloodshed between the sons of one nation." MOSUL, Iraq (AP) — Iraq on Monday declared "total victory" over the Islamic State group in Mosul, retaking full control of the country's second-largest city three years after it was seized by extremists bent on building a global caliphate.